​emphasising the joy of yoga and relaxation. Ellen has a deep understanding of the body from her lifetime as a dancer and 19 years as a yoga teacher. She has a thorough knowledge of yoga, qigong and the latest western scientific research on health and exercise. Her classes strengthen and organize the body to help students prevent strain in their daily lives and protect against injuries. She can quickly see what each student needs to improve strength, flexibility and balance. Ellen is a warm and precise teacher. Her classes are meditative and calming while giving attention to stretching and strengthening the entire body. 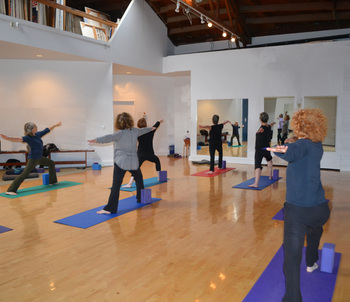 Ellen teaches yoga as a physical, emotional and spiritual practice and emphasizes the joy of yoga and meditation. Classes are focused on alignment and sequencing. They use visualization and imagery to make yoga poses accessible to students of all body types and ages. Ellen specializes in the use of props and modifications to assist students who are new to yoga or working with limitations or injuries. ​​The Ellen Webb Studio is also available for rental. Please go to ellenwebbstudio.com for studio rental information.